On november 26th TTWarsaw tourism fairs were officially opened. During the ceremony, Tech Travel Awards were given. Main purpouse of the Tech Travel Award is to find and award most interesting IT solutions that focus on tourism industry. Magello won the main award in category "innovative solution". 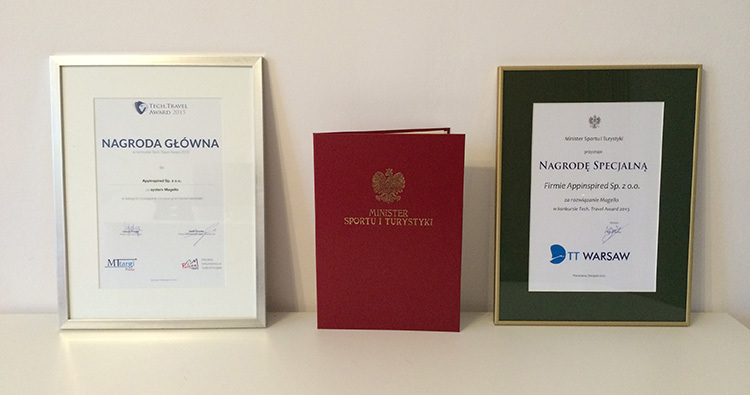 Additional bonus was the main award from Minister of Sports and Tourism. We treat those awards as a recognition of the hard work that our whole team has put into Magello - a unique solution for travel infustry. We send warm regards to every participiant of this competition. Kudos!